We are happily on Tioman Island, the largest of a small island group some 100 miles up the Eastern side of peninsular Malaysia. Legend has it that a Chinese dragon princess was flying over these waters to her wedding when she changed her mind, taken with the beauty of the scene, and instead curled her tail about her and became Tioman Island. Tioman is lush and beautiful, with many low-key resorts, diving schools and clear water. We've yet again found ourselves in a small marina for a few days as Scott had to replace the alternator bracket (without which we cannot make power). This has meant many trips backwards and forwards to the little workshop he tracked down, where they were able to make him a new bracket. We've been catching up on school (please don't anybody tell the boys that it is technically school holidays) and I've been loving the chance to go for some early morning runs around the great hills and jungle tracks. The local eateries are good and cheap and we can get to the best beaches easily by dinghy – much too hot to walk in the heat of the day. We've been doing lots of research into the next part of our journey – some 350 nautical miles across the South China Sea to Borneo. For those of you that need to look it up ( I won't tell you where I thought Borneo was until we started planning this trip), Borneo is the Malaysian West/ North part of the island and Kalimantan (Indonesian) makes up the South/ Eastern part. Brunei is a tiny independent country squeezed into Borneo on the West coast. We're waiting for the right weather to present itself, though we are not expecting to actually be able to sail – a rare occurrence in South East Asia. What we are hoping for is not too much wind blowing in the wrong direction! Once we get there we'll be exploring the region of Sarawak for a few weeks, including the great Rajang River that will take us 70 miles inland to the city of Sibu. From there, North towards Brunei and Kota Kinabalu in the region of Sabah. Again, rivers to explore and hopefully jungle to traverse. Will keep you posted. The areas we're going into are far less visited than everywhere we've been so far. We'll be travelling with our friends on Red Boomer, which we're all looking forward to. In some places it's not wise to leave the boat unattended and having a larger group will make things easier. 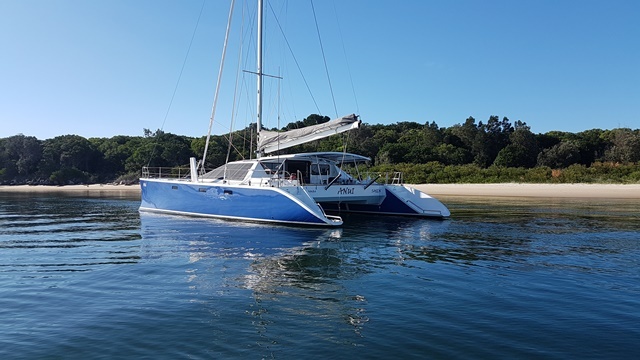 A small plug - for those of you in Australia, we have another article coming out in Multihull World in the beginning of May and I think one in June in the UK version by a similar name. For those of you who have been on tenterhooks since the last blog - the washing machine, now known as Steve Austin, is behaving nicely. The geckos still show no signs of hatching. How long is the incubation time for geckos?